Glovius v3.2 for Android is now available! All new “My Files” interface – We have completely overhauled the “My Files” interface, combining the files available on disk, as well as those available in your Babel3D account, but not yet downloaded. You can tap any file to download on the device. Simultaneous downloads are also supported now, making it easy for you to get all your models in one shot. Tap a downloaded file to open. You can also search for files using the new “Search” box on top. Shadows – Glovius now displays Shadows in the graphics area. You can switch this off from the Settings menu. Model Views – Files containing “Model Views” will now be able to display them using a preview strip in the graphics area. To switch to a “Model View”, simply press its preview image. Model Views govern the visibility of components and PMI as well as camera orientation. 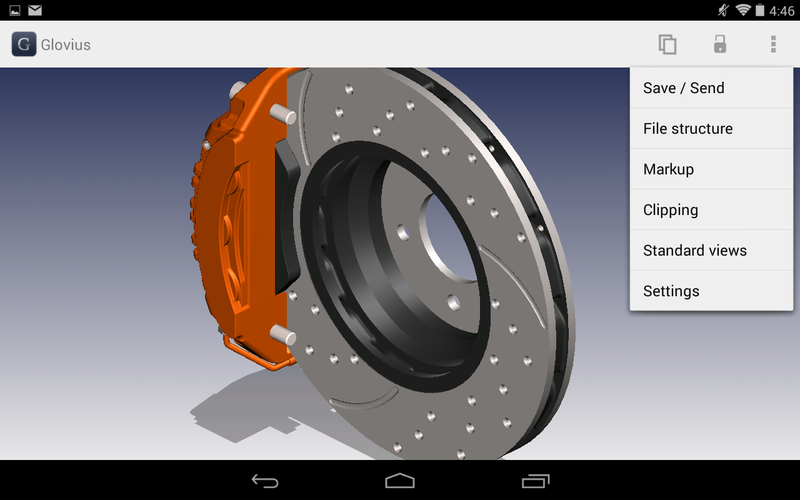 Model Views in JT & CATIA V5 files (known as Captures) are exported in the Glovius mobile format.